Measurements: 2.76 x 4.61 inches, or 70 x 117 mm. Booklet included: Yes, 72 pages, 2.7 x 4.59 inches, or 69 x 117 mm. Publisher: Llewellyn Worldwide. Printed in the US. The suit of Vajras [blue borders] represents Aksobhya, the Buddha of the east. His Sakti is Locana, his animal is the elephant, and his Dakini is Vajradakini. This suit represents the color blue, the element air [Swords], and the thinking function. The suit of jewels [yellow borders] represents Ratnasambhava, the Buddha of the south. His Sakto is Mamaki, his animal the horse, and his Dakini is Ratnadakini. This suit represents the color yellow, the element earth [Pentacles], and the sensation function. The suit of lotuses [red borders] represents Amitabha, the Buddha of the west. His Sakti Pandara, his animal is the peacock, and his Dakini is Padmadakini. This suit represents the color red, the element fire [Wands], and the feeling function. The suit of double vajras [green borders] represents Amoghasiddhi, the Buddha of the north. His Sakti is Tara, his animal is the garuda and his Dakini is Visvadakini. This suit represents the color green, the element water [Cups], and the intuition function. 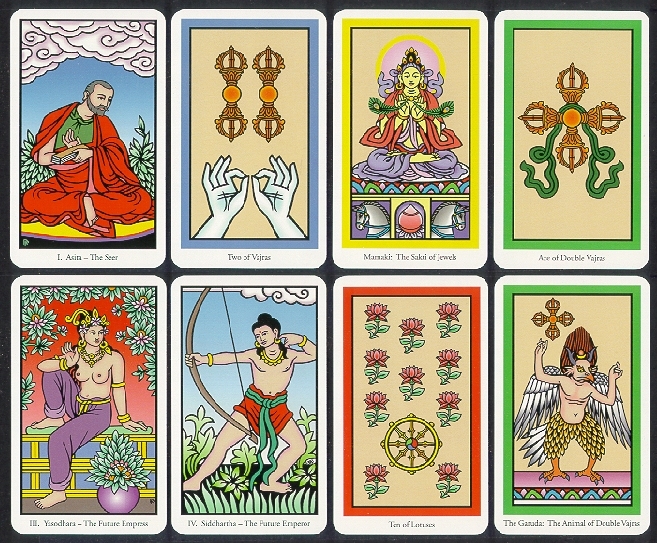 Court cards are Dakini (page), animal (knight), Sakti (queen) and Buddha (king). Notes in the book are very good. There is also a book available, The Buddha Tarot Companion, by Robert M. Place, $16.95. As much as I like this deck, the packaging was not so good. It comes in a box measuring 5.5 x 8.5 x 1.7 inches, or 14 x 21.7 x 4.5 cm, eg, about the size of a typical deck & book set. But inside there is no book. Inside the box is a smaller - empty - box, which takes up half the interior space. Packed in a corner are the deck, the instruction booklet, and a black sheer cloth bag (looks like the top of a nylon stocking). Of late, Llewellyn has done better. The big box inflates shipping, especially to overseas addresses.